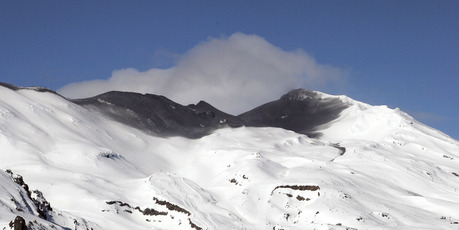 The likelihood of Mt Ruapehu erupting has increased, GNS Science says. GNS Science duty volcanologist Steven Sherburn said changes in measurements at Ruapehu over the last few weeks indicate eruptions are “more likely over the next weeks to months”. “We are monitoring Ruapehu closely, but it often does not give any immediate warning that it is going to erupt,” Dr Sherburn said. “We think that the temperature a few hundred metres beneath Crater Lake is about 800 degrees Celsius, but the lake itself is only about 20 degrees Celsius. This suggests the vent is partly blocked which may be leading to a pressure build-up beneath Crater Lake. As a result, the Aviation Colour Code has increased from Green to Yellow. However, the Volcanic Alert Level remains at 1. Code Yellow indicates a volcano is experiencing signs of elevated unrest above known background levels. GNS said small earthquakes have been occurring about 5km beneath the summit area of Ruapehu since late-October, but these may not be directly related to the high temperatures beneath Crater Lake as the earthquakes are much deeper.